Empress Zewditu with one of her favored priests. As we welcome Ethiopia's first female President Sahle Zewde we must also remember her historical predecessor. 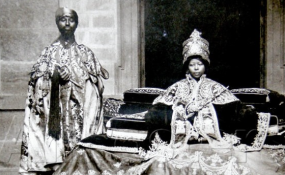 Empress Zewditu was the first female head of an internationally recognized state and was both the first and last Empress regnant of the Ethiopian Empire. Empress Zewditu whose name means "the Crown" was an ambivalent leader known for her staunch conservatism and religious devotion, who ruled Ethiopia from 1916 to 1930. She was the eldest daughter of the then Negus (or King) Menelik of Shewa. At the tender age of ten she was married off to Ras Araya Selassie Yohannes, son and heir of Emperor Yohannes IV. The political marriage was arranged when Menelik agreed to submit to Yohannes' rule and ended two years later in 1888 when Ras Selassie died. Although relations between her father and her father-in- law were strained, Emperor Yohannes IV sent Zewditu back to Shewa with valuable cattle as a testament of his affection for her. She had two further brief marriages before marrying her stepmother's nephew Ras Gugsa Welle; an army commander and member of the royal family. Her father Negus Menelik of Shewa assumed power and became Emperor of Ethiopia in 1889 after the death of Emperor Yohannis IV at the Battle of Metemma. He ruled for 24 years Negus Menelik II and when he died Lij Iyazu; the son of Zewditu's half-sister who had been publicly declared heir apparent; claimed the throne. Iyazu went on to exile Zewditu and her husband to the countryside because she posed a threat to his position. Fortunately or unfortunately Iyazu was never crowned. He was disliked for his unstable behavior by the nobility, while the church held him under suspicion of apostasy (the abandonment of religious belief) according to historical accounts. This lead to his removal from power and Zewditu's ascension in 1916. Under her official title "Queen of Kings" (Negiste Negest) Zewditu's rule became a regency. The Empress was not allowed to exercise power herself so instead, her cousin Ras Tafari Makonnen was appointed regent. The contrast however between the two principles was glaringly evident; Ras Tafari Makonnen backed by the nobles was a modernizer who believed Ethiopia needed to embrace the world while Empress Zewditu backed by the church was a conservative who wanted to preserve Ethiopian tradition. But as Zewditu faded from active politics and deeper into religion, Ras Tafari Makonnen led Ethiopia into the League of Nations and the abolishment of slavery. Due to his reforms a number of attempts were made to replace him but the Empress remained in avid support of him despite their differences. After her death in 1930 for yet unclear reasons, he succeeded her and Negus Tafari Makonnen took on the name of Emperor Haile Selassie from then henceforth. Empress Zewditu would be the last monarch in direct agnatic descent from the Solomonic dynasty; also known as the House of Solomon is the former ruling Imperial House of the Ethiopian Empire, whose members claim patrilineal descent from the biblical King Solomon and the Queen of Sheba.